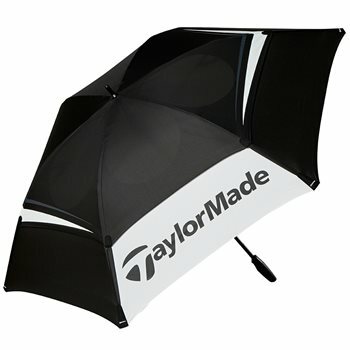 GlobalGolf / Accessories / Umbrella / TaylorMade / Tour Double Canopy 68"
The TaylorMade Tour Double Canopy 68” umbrella has been specially designed to reduce inversion during strong winds and has an elastic venting system that helps keep the canopy intact and reliable. The umbrella features large port holes for rapid air release and spring loaded tips that generate a taught canopy to deliver a wing-like form in high winds. The shaft is made of aircraft aluminum that is lightweight with high strength properties.